This is my review of the Renaissance Paris Republique hotel, an impressive Marriott property. 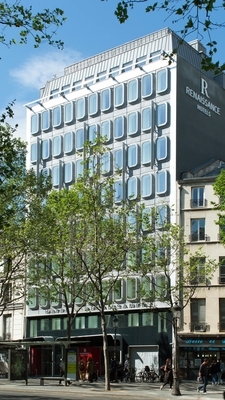 The official Renaissance Paris Republique website is here. I needed a hotel for one night when I was in Paris last week. Prices were through the roof and my usual haunt, InterContinental Paris Le Grand (very well placed for shopping, the airport bus and Eurostar), was full. As I needed a guaranteed late check-out, I decided to look at the Marriott Rewards redemption options. Gold and Platinum members of Marriott Rewards get a 4pm check-out at most brands. Availability was also tight there, but my eyes settled on a hotel I had never even heard of before – the Renaissance Paris Republique. It was almost 30 years since I last stayed in a Renaissance hotel. Apart from a vague feeling that they are pitched above the level of your average Marriott (the amazing hotel at St Pancras is a Renaissance) I couldn’t list a single specific feature of the brand. I was instantly attracted by the modernist building and what looked like a very impressive recent refurbishment and for a one-night stay there was little at risk. It turned out that I had never been to Place de la Republique, despite spending around 50 nights in Paris over the last 20 years. It has a lot going for it. It has the same architectural style to the main tourist areas but is not a tourist hub. It is filled with ‘practical’ retail rather than even more branches of Zara. More importantly, a lot of metro lines converge at Republique. Gare du Nord for Eurostar is only three stops or a modest walk (I walked) and the ‘grands magasins’ at Opera are also only a few stops away (again, I walked it easily). Check-in was efficient, although I felt it a little odd asking a British guy in his 40’s whether he had been to Paris before! My room wasn’t ready but it was fast-tracked and I was asked to wait 10 minutes – and it was ready in 10 minutes. Probably the most welcome ‘welcome gift’ ever, given how hot a day it was. The wine was chilled. Here are a few shots of my Renaissance Paris Republique room. I discuss the room type later. There is no desk as such but it was easy to work off the table. There were two EU sockets at floor level under the table. Wi-fi was fast and free. I couldn’t get a good bathroom photo – there is only a shower and no tub. There is a capsule coffee machine – just visible in the picture above – plus a good minibar. This was a very classy room with high quality furnishings and I’m not sure the photos do it justice. Huge amounts of money have been spent on the interiors – I even took photos of the lift lobbies because I was so impressed. There is no buffet at Renaissance Paris Republique, which is rare these days. Everything is a la carte. If breakfast is included in your rate, or if you are Gold / Platinum, you are comped a €29 set menu and you can add other items as you wish. If you are in a hurry, the hotel has set up trays of pastries and coffee at the bar and you can ‘grab and go’ for free. One downside of the hotel is that it has, at least on Flyertalk, a reputation for not upgrading elite members. As the smallest rooms were a bit too small for my liking, I paid a supplement at the time of booking to secure a better room. The ‘Bobo room’ I booked, which is one category higher up, was €40 extra on top of the 40,000 points I used. I don’t think I got upgraded any further. This is one of my favourite features of Marriott Rewards. Hotels are able to offer their superior rooms for redemption at the standard points price, but with a cash supplement. We are using the same feature in Venice next month to guarantee a ‘sleeps four’ Junior Suite at the JW Marriott. The Renaissance Paris Republique hotel is a very classy, very civilised place to stay. Whilst you are not directly by any major tourist sites, Republique metro has an exit immediately outside the hotel entrance and you can easily get to wherever you need to be or to Gare du Nord. You can also walk to a lot of key places. One upside of being in a more residential area is the large number of cafes and restaurants near the hotel. Impressively, Renaissance Paris Republique is actually getting CHEAPER when the Marriott Rewards and Starwood Preferred Guest schemes are merged in August. It will drop from 40,000 points per night to just 35,000 points. At peak periods, you will easily exceed my target 0.5p valuation for Marriott Rewards points – next Tuesday the hotel is selling for €387. The Renaissance Paris Republique website is here if you want to find out more. Thanks Rob, this is the hotel I want to redeem a travel package. It seems even better than I expected except I’m not a great fan of open or glass walled bathrooms. I just hope your review doesn’t make availability more difficult. Place Republique is my favourite area in Paris, it has a much more authentic rough around the edges local feel to it. My wife and I stayed at this hotel for 4 nights in April and it was fantastic. Our rate included breakfast and we took advantage every morning as it was absolutely delicious. They basically told us to order whatever we wanted and were never charged anything. The service was consistently outstanding. We were Platinum at the time and did not receive an upgrade, but that’s OK. I booked an Artist Studio Suite which was extremely pleasant and had a good view of Paris. The bed was comfortable – one of the more comfortable I’ve slept in in a hotel. The open bathroom was fine and I think it is important to mention that you can draw shades to cover up the windows in there if you’d like (in addition to the sliding door) so the bathroom is actually private. I worked a few afternoons while we were there and I felt the setup was adequate for me to use my laptop and get real work done. The area was fantastic and there were excellent restaurants with delicious food within comfortable walking distance. 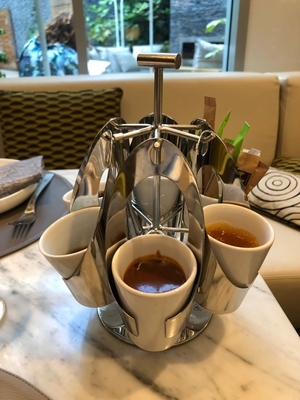 The concierge team recommended several good places and my wife found Chez Monsieur nearby, which the concierge called and made a reservation at. It was amazing. I recommend this hotel to anyone who has any desire at all to go to Paris – the price was definitely right when we went so I just paid cash out of pocket rather than booking with points. I agree République is a great area. I stayed at the Crowne Plaza last Saturday. It’s in an historic building with wonderful views onto the Place or a huge internal courtyard. As a Spire member I got a large Clubroom and access to the (admittedly basic ) executive lounge. I thought it was great value for €124. Thank you to both Nicholas (for confirming that the bathroom windows can in fact be covered up) and John McManus for comments about the Crowne Plaza. Both very useful. I nearly always stay in Republique, usually Crowne Plaza, maybe not as upscale as the Marriott , but Massive rooms, a lovely courtyard and a top restaurant (closed sunday and Monday) and a great breakfast. Last stay was in May with wife and two youngish kids. As Rob says; the transport connections there are first class, If staying with family the cost at this location is also a factor, as its considerably cheaper that the usual very central suspects. Anybody without decent French can google translate it, I doubt if it describes Raffles quite to a tee, somehow: Le terme bobo, contraction de bourgeois-bohème, désigne un sociostyle, c’est-à-dire une tentative de caractériser un groupe social selon les valeurs que ses membres partagent, plutôt que selon leurs caractéristiques socio-économiques ou démographiques. S’il est difficile de précisément décrire un bobo, le sociologue Camille Peugny donne en 2010 cette définition : « une personne qui a des revenus sans qu’ils soient faramineux, plutôt diplômée, qui profite des opportunités culturelles et vote à gauche ». Le terme est utilisé pour la première fois par le professeur de sociologie Michel Clouscard, défini comme bourgeois libéral-libertaire (lili-bobo) dans Néo-fascisme et idéologie du désir (1973) : économiquement à droite et idéologiquement à gauche ; le plus souvent, le bobo se prétend du peuple tout en possédant un gros patrimoine et d’importants revenus ; il n’a par conséquent pas la mentalité d’un homme du peuple, qu’il soit prolétaire, artisan ou marginal. Le terme est ensuite repris par les médias. Le livre Bobos in Paradise: The New Upper Class and How They Got There de l’Américain David Brooks, publié en 2003, définit le bobo comme une personne aisée. À partir de cette définition générale, différents attributs peuvent être ajoutés à l’archétype du bobo : urbain, écologiste, idéaliste, arrogant, etc. Brooks a forgé ce terme pour décrire ce qu’il ressent comme une mutation positive de son propre groupe social : les yuppies des années 1980, dont le mode de vie bourgeois se serait hybridé avec les valeurs bohèmes de la contre-culture des années 1960-1970. ‘une personne aisée’ ? I’d say that fits Rob perfectly! Him well hipster… in the 1970,’s maybe. Sounds like they know their rooming clientele is about that age :-). For me Republique was ruined when Tati closed there. You could turn up some amazing bargains in lingerie there. Also a change on the metro to be avoided in rush hour especially if you have luggage. The lines don’t really all converge so you have lots of stairs to go up to go over the tunnel for one line only to have an identical stairway down the other side. Over and over if you are unlucky as so many lines have a stop there. You have luggage, Lady London? Does anyone know the exact date of the Marriott/SPG changes? I’m looking at booking a Marriott in Singapore in early August, I currently have SPG/ Marriott gold through Amex platinum and am wondering if I will get lounge access? Sadly not. Many people assume 1st August but Marriott have not confirmed this. My travel plans for next summer (bound to school holidays) hinge (no pun intended) on this as I have an unattached travel package hotel certificate and enough points for another cat1-5 travel package. Knowing what will happen when will basically dictate our summer next year. Looks great! As I always say, breakfast cooked to order is a great marker of a high quality hotel. Sounds like most of you here! Stayed at the Renaissance Malmo, Sweden last year (sadly no longer a Marriott hotel) and was also very impressed. You had your own personal balcony, Nespresso machine (plus usual kettle) and the hotel decor was amazing. They had a massive pink elephant in the foyer! If they had continued giving free breakfast to SPG gold members it would have been my new favourite brand I think. Why is that? I’m in the same age bracket as you. I’ve done two RTW trips and visited over 50 countries, including places like Laos and Mongolia, yet I’ve never been to Paris. In fact, I’d never even been to Greece or Spain until three months ago. I’ve been to 4 continents (5 if you count a few hours in Hong Kong airport) and even been to France…but not Paris. Yes, I would have found it very odd as well. Mind you, I have no idea of how many times I have actually stayed in the city. Then there is the number of times I have been there just for a few hours when changing trains. Some very useful info here, Rob. Thanks. Perhaps you’re not a bobo then. As I lived in France for a year plus occasionally worked there over the years, I got to see a fair bit of Paris – a brilliant place. I do like France a lot, so much better than UK in most respects. Equally, those who have not seen the real Spain or the real Greece – you’ve missed out, big time! Two of the best countries in the world. Fantastic Vietnamese food just up the road towards Belleville too. Canal Saint-Martin nearby is a lovely area for food and drinks. From reading around it seems that Marriott hotels not upgrading Platinum members is par for the course – with Marriott it seems “you get what you pay for” and even if you have status anything else is a rare bonus. I think SPG Plat members moving over will be surprised and disappointed compared with the regularity (and quality) of Starwood upgrades. If you had the choice between InterContinental Paris Le Grand and Renaissance Paris Republique now, which would you opt for? For a reward stay I’d probably take the Renaissance – note that I would get 4pm check-out at both as a Marriott Plat / IHG Ambassador, but only free brekky at the Renaissance. For cash, pricing being roughly equal, I’d do Le Grand via Emyr, because Virtuoso clients get free access to the lounge – which is exceptionally good at Le Grand – and a guaranteed upgrade to a Superior room at time of booking. Le Grand is currently undergoing renovations, however, so they are operating on a sharply reduced number of bedrooms and it is sold out more often. It doesn’t impact stays as they are doing it a wing at a time and the public areas are not being touched, at least at the moment.